Greg Mankiw's column in Sunday's New York Times makes the case that competition between governments is a good thing, that it makes them more efficient in the same way that competition among firms does. He paints it as also being about choosing redistributionist policies or not, with Brad DeLong and Harold Pollack both ably making the case that of course governments should engage in redistribution. As author of Competing for Capital, however, I am more interested in the question of whether government competition for investment leads to more efficient outcomes. The answer, in short, is that it does not. Indeed, competition for investment leads to economic inefficiency, heightened income inequality, and rent-seeking behavior by firms (a further cause of inefficiency). ...competition among governments leads to better governance. In choosing where to live, people can compare public services and taxes. They are attracted to towns that use tax dollars wisely....The argument applies not only to people but also to capital. Because capital is more mobile than labor, competition among governments significantly constrains how capital is taxed. Corporations benefit from various government services, including infrastructure, the protection of property rights and the enforcement of contracts. But if taxes vastly exceed these benefits, businesses can – and often – move to places offering a better mix of tax and services. Via @RichardJMurphy, the Tax Justice Network reports that yesterday the IRS and Treasury Department released new regulations requiring banks to report interest income to foreigners' tax authorities. TJN describes this as "a big win for transparency," and indeed it is. It is a welcome step away from the hypocrisy the U.S. has displayed in pressing foreign governments to cooperate with the IRS, while turning a blind eye towards the way the U.S. can function as a tax haven for foreigners. Predictably, Senator Marco Rubio and Rep. Bill Posey, both Republicans, have introduced legislation that would overturn the regulations, according to Bloomberg. Stay tuned. 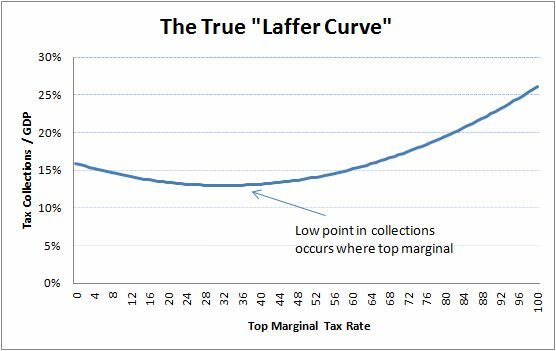 Mike Kimel at Angry Bear has several nice posts on the "Laffer Curve" that underlies much of conservative economic orthodoxy in this country. As you may know, Art Laffer famously claimed that at tax rates of 0 and 100%, you would get zero tax revenue, and that in between, there is an inverted U shaped curve, where taxes collected first increase as the tax rate goes up, then decrease as tax rates go higher still, back down to zero tax collected when the tax rate is 100%. The Kimel post linked above was prompted by an economist at the American Enterprise Institute, Alan Viard, telling the New York Times that all economists know that when the top tax rate is 35%, cutting rates further will reduce tax revenue. Except, as Kimel points out, lots of conservative economists dispute this, including one who co-authored a paper with Viard! For his trouble, Kimel became the subject of a post at the AEI blog by James Pethokoukis, which started by completely misidentifying him and going downhill from there. For Kimel's enjoyable takedown of this post, see here. Not only that, as one of Kimel's commenters, Robert Waldmann points out, we actually have experience with a country having a top marginal rate over 100%, Sweden in the 1970s. Contrary to Laffer, not only was tax revenue not equal to zero, in 1975, Sweden's tax revenue was 41.3% of gross domestic product! (OECD statistics, click on "data by theme," then "public sector, taxation, and market regulation," then "taxation," then "revenue statistics - OECD member countries," then "comparative tables") 21.2% was central government revenue, i.e. excluding subnational government and social security. Either way, a long way from zero. Not to belabor the point, but Viard was right about tax revenue after President Bush's tax cuts. Here is the OECD data for the federal government, excluding Medicare, Medicaid and Social Security. First we see the effects of President Clinton's tax increase, then President Bush's tax cuts. Before you supply-siders get too excited about the increase in 2006 and 2007 to 11.9%, remember that the higher Clinton tax rates brought in more revenue for five straight years, 1996-2000. Though many journalists get it wrong, chessplayers like myself know that "refute" means to conclusively disprove. And the Laffer Curve stands refuted.